For the most part, employers will likely staff these positions with workers who have completed some formal education beyond high school. But that could cause a disconnect in the Evergreen State, where only 40 percent of high-school graduates ever go on to earn a college degree, apprenticeship or other such credential by the time they turn 26. That means employers likely will have to import workers from other states — or countries — to fill high-demand jobs, especially those that pay well in the science, technology, engineering and math (STEM) fields. On Wednesday, Washington STEM, a nonprofit that advocates for education in those subjects, released a series of reports that shows, region by region, where the state has the most work to do so more of its K-12 students can earn some credential after high school — and claim those future jobs. We spoke to the reports’ author to see what the numbers mean for King County and beyond. While more than half of ninth-graders ultimately pursue some type of schooling after high school, less than half of them actually finish those programs. Statewide, 59 percent of students enrolled in a postsecondary program after graduation, whether that’s an apprenticeship, technical college or four-year university. However, by age 26, just 40 percent ever finished. Jenée Myers Twitchell, the reports’ author and impact director for Washington STEM, said the King County region needs to boost that rate to more than 85 percent to prepare more students for the nearly 54,000 jobs projected to require some form of postsecondary education by 2024. “King County has the highest need for credentials,” Myers Twitchell said. “We really need to have the vast majority of our K-12 students coming out of high school and entering into a credential right away,” she said. But even if 100 percent of high-school graduates in King County earned a credential, Myers Twitchell said that still wouldn’t fill all the jobs of the future here. 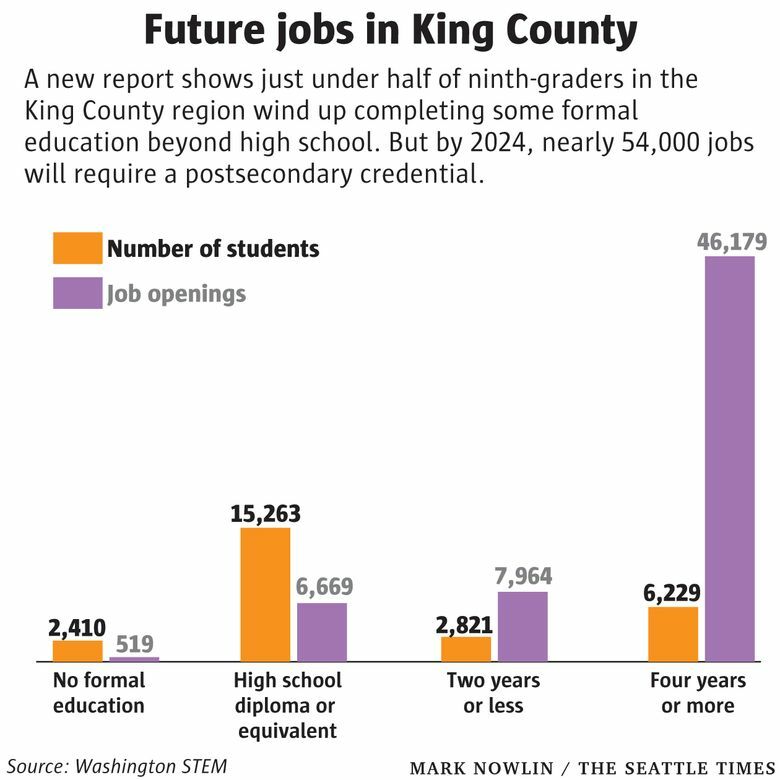 That creates opportunity for the other regions in the state, where Washington STEM breaks down exactly how many credentialed students could fill the surplus of expected King County jobs. Spokane and the Eastern region, for example, could provide nearly 3,000 credentialed workers to King County. Be aware that locally based tech companies, including Boeing and Microsoft, provide financial support to Washington STEM and certainly would benefit from schools preparing more of their future workforce in their backyard. Just this week, tech giant Amazon also announced what it called a childhood-to-career program to train up to 10 million students in computer science. And across the nation, a push for more STEM classes — and for using more technology in K-12 schools and colleges — comes amid murky predictions of what the future of work actually is. Still, the new Washington STEM reports reveal some pretty stark gaps in what types of students are likely to ever earn a credential after high school. In King County, 55 percent of both Asian and white ninth-graders earn a credential by age 26. But less than a third of low-income, American Indian/Alaskan Native, black and Latino students do the same. While detailing those gaps is important, Myers Twitchell said, the reports don’t address why they exist, and how they might close. As an example, she noted it’s unclear where high schools have offered college-level courses to get more students of color and low-income students onto the pathway to a credential. “So if we want to double how many students earn college credit in high school, we still need to know how far away from that we are in the first place,” Myers Twitchell said. In the reports, Washington STEM shows how many children in each region walk into kindergarten ready for day one and, by third grade, how many students meet grade-level standards in math. The reports, however, don’t offer any steps that individual teachers, principals and parents can take to get more students ready for the jobs of the future. Myers Twitchell said that kind of information will arrive in February, when Washington STEM releases new school-by-school and district-by-district data and recommendations. “If you can break it down to a level that’s digestible and actionable … you can actually see yourself making progress,” Myers Twitchell added.